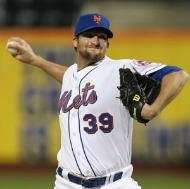 A few weeks ago we discussed Bobby Parnell as question #3 in Mets spring training. The question was whether the fireballing righthander would take a step forward as a MLB pitcher — i.e., evolve into a bonafide setup man (or, dare I say, closer?) — or has he reached his ceiling? Remember when Bobby Parnell was a young fireballer who looked like he might be the Mets’ closer of the future? We figured he’d take a career path similar to that of J.J. Putz, Brad Lidge, or Jonathan Broxton: he’d eventually harness that heat, spend a year or two as a lights-out setup man, then step in as a 35-40-save fireman. Unfortunately, Parnell has yet to evolve into a reliable setup man; in fact, it’s still questionable whether he can be relied upon to protect a close lead as a middle reliever. Sure, he has that eye-popping 9.7 Ks per nine innings, and he frequently flirts with triple digits on the radar gun. But pitchers who throw 100 MPH shouldn’t be allowing more than a hit per inning, and Parnell’s walk rate nearly doubled from 2010 to 2011 — jumping from 2.1 BB/9 to 4.1. A late-inning reliever expected to protect a slim lead simply cannot allow that many baserunners. Though Parnell did show flashes of brilliance as a setup man, and he did convert 6 saves in his brief audition as closer, the jury is still out as to whether he can sustain success over a 162-game season. His lapses in command are maddening, and he has yet to develop a reliable secondary pitch. At times, his slider has that vintage Lidge look, but those times are few and far between; usually, Parnell chokes the pitch and buries in the dirt far from the plate — or, he releases it too early, leaving it in the middle of the strike zone while “speeding up” the hitter’s swing. Maybe I’m evaluating Parnell too harshly, but whit his velocity and ability to get the ball into the strike zone, it is agonizing to see him take a step back at time in his career when he should be taking steps forward. Parnell failed his closer audition — and in fact, fell below Manny Acosta on the totem pole by season’s end. If that’s not a wake-up call I’m not sure what is. Guess what, folks: Bobby Parnell is no longer a young phenom — he turned 27 in September and will be 28 by the end of 2012. Sure, some pitchers are “late bloomers” but generally speaking, if a guy throws 100 MPH and doesn’t figure it out by now, he’s not likely to figure it out. For one, velocity tends to start reducing as a pitcher inches toward and passes age 30 — and once Parnell loses his other-worldly fastball speed he has nothing else to offer. That’s not to say it’s too late for him to “figure it out”, nor that the Mets should give up on him. On the contrary, if Parnell can simply command his slider 7 out of every 10 times (instead of 4 or 5 times) he takes the mound, he’ll immediately become a decent closer for a second-division team (such as the 2012 Mets). Will that happen? Hard to say — it all depends on whether he can find the correct timing of his release, and that’s easier said than done. When Jason Isringhausen walked off of a softball field and into spring training in Port St. Lucie, expectations were low. After all, the 38-year-old hadn’t thrown a big-league pitch in almost two years — and even then, it was only 8 innings before blowing out his elbow and undergoing season-ending Tommy John surgery. Izzy himself wasn’t necessarily convinced he could pitch in MLB again — he had resigned himself to playing recreational softball after a brief comeback attempt in AAA during 2010. But nonetheless, he gave it the old college try. And who were the Mets to deny any pitcher entrance to their spring training complex, much less one with Isringhausen’s resume and previous history with the organization? It was a longshot, and if Izzy could just make it back on a big-league mound it would make for a fabulous feel-good story. As it turned out, Izzy gave the Mets and we fans much more than that.